Israeli Prime Minister Benjamin Netanyahu’s political future is in jeopardy, but his most serious crimes have nothing to do with the corruption charges that he may face, says Shir Hever. B. NETANYAHU: (Translator): After I read the recommendation report I can say it is biased, extreme, full of holes, like Swiss cheese. AARON MATÉ: Joining me is Shir Hever, Real News correspondent, author of The Privatization of Israeli Security. Welcome, Shir. This investigation has been going on for a long time. Now we have a recommendation of charges, but the charges, as I said, are not for sure. Talk about what is being alleged here. SHIR HEVER: Yeah. 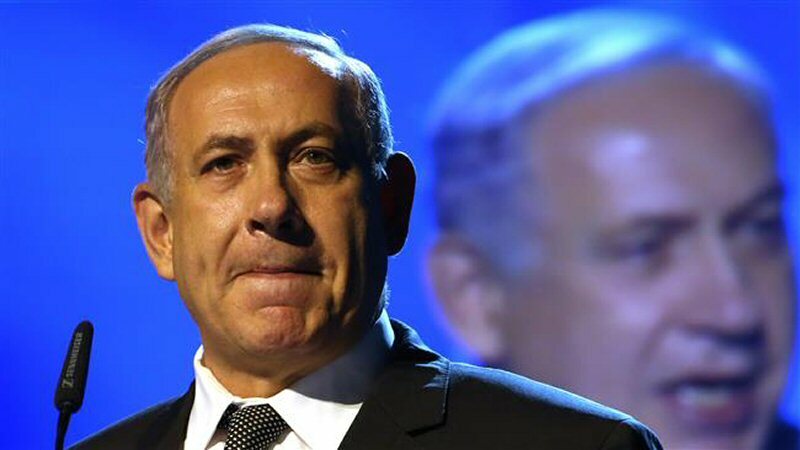 The two cases that the police has against him, Netanyahu, are very strong cases. People came forward, which were very close to Netanyahu, and it’s based on secret recordings of people who came forward as state witnesses, like Ari Harow, who’s a chief aide of Netanyahu, making these recordings from within his office. And so, I think it’s very clear what happened, but all of this has been known for about two years now. The question is, whether this is going to get to the point of pressing charges, is rather a moot point at this point because the chief prosecutor of…, who is a close friend of Netanyahu, like you said, he was his aide, has done everything in his power to postpone pressing charges. And I think by doing that, he made it very clear where he stands. That he’s going to try to defend Netanyahu as much as he can and buy Netanyahu as much time as possible.There was an attempt to legislate a law that would make it impossible for the police to publish their recommendations, but there was such a public outcry about this that they decided, the law did pass actually, but it was changed in the last minute so that it wouldn’t apply to Netanyahu. So, the police now came forward with their recommendations. They actually start the text of their recommendations by saying, “We’ve completed our investigation, everything is known to us at this point.” I think…maybe can wait a little bit longer, buy a little bit more time for Netanyahu, but he cannot really stop the moment of pressing charges. AARON MATÉ: Shir, you read the charges, the document alleging the infractions against Netanyahu, what stood out to you? SHIR HEVER: The one thing, a lot of this text was pretty much well known. There was the case of receiving various gifts worth quite a lot of money, champagne, cigars. A very decadent lifestyle that was funded by two very rich millionaires in exchange for Netanyahu helping them getting a visa to the United States, helping them with taxes within Israel. That much was known. What was not known, however, is that Netanyahu tried to pass a law back in his previous government, between 2013 and 2015, which would benefit one of those two millionaires, Arnon Milchan, and that this law was blocked by then Minister of Finance, Yair Lapid.So, now Yair Lapid, who’s currently a very senior member of the opposition, one of the only people who can challenge Netanyahu in the next election, turns out to be the chief witness of the police in this case. Yair Lapid is very critical of Netanyahu and has no problem speaking openly about Netanyahu’s corruption. And, of course, this makes the whole thing very political and then it falls on the shoulders of Yair Lapid, if he’s a good enough witness, and if he has good enough records he could use that to become the next Prime Minister. Of course, this is a point that Netanyahu makes very clear in his defense blaming the police for making a political case against him. AARON MATÉ: In Netanyahu’s defense, his supporters say, I mean, there are allegations that he tried to change, he tried to take measures that would benefit his donors, but they ultimately did not materialize. Is that a fair characterization of the result of Netanyahu’s alleged efforts? SHIR HEVER: Well, some of these benefits did materialize when it comes to those millionaires receiving help but also in restricting someone. A newspaper funded by… which is a very prominent Netanyahu newspaper given out for free in Israel. That was the second case against him. Netanyahu did actually admit that he made some efforts with regard to that newspaper to control it, to help it, or to hinder it, and that was while he was negotiating with Noni Moses, the head of the competing newspaper Yedioth Aharonoth, and if you follow this newspaper, Yedioth Aharonoth, you can see that the coverage of various Israeli politicians, whether they’re members of Netanyahu’s government, or in the opposition, varied along those negotiations. That is a very strong case.I just want to say one thing though. When we’re talking about these cases of corruption, that distracts us somewhat from the real crimes committed by Netanyahu. Obviously, Netanyahu is corrupt as a politician, and that’s something that pretty much every Israeli knows, and I think a lot of Israelis voted for him knowing that he’s corrupt, and knowing that he received these gifts even in the previous election. What I think should be also, has to be said when we talk about him, is that Netanyahu’s also a war criminal, and that his more serious crimes is the invasion of Gaza of 2014, various racist statements against Palestinians, and the attempt to use those kinds of racist statements, and military attacks, killing of Palestinian civilians as a way to gain popularity in order to protect himself from the rule of law, from those accusations of corruption, and he’s doing that now again by blaming the police for being too close to the opposition, and hoping that some kind of public support, populous public support from the right-wing, from the racist parts of Israeli society, would keep him in power. AARON MATÉ: Finally Shir, based on the history of corruption allegations against Israeli Prime Ministers, which there are several, and the fact that Netanyahu still enjoys, has some strong allies in the Israeli government in the Parliament. Do you think he survives this? SHIR HEVER: Netanyahu is the first Prime Minister in the history of Israel who’s faced with recommendations for charges by the police, refuses to resign. His coalition now is based on a group of parties and the religious parties, the ultra Orthodox religious parties will support him because they know that Yair Lapid, his main opponent, is very strongly opposed to them. And so they want to keep Netanyahu in power, even if it means supporting an openly corrupt Prime Minister. That leaves the other members of the coalition in a very precarious situation. We’ve seen the Minister of Finance, the current Minister of Finance saying that he’s going to stay in the coalition at least until… actually decides to press charges, the state attorney.That gives Netanyahu a little bit more time and the head of the Jewish Home Party, Naftali Bennett, is also in a somewhat precarious situation because his party is seriously opposed to the judicial system, to the courts. The Minister of Justice is from this Jewish Home Party, is trying to replace as many judges as possible. On the other hand, they’re very pro-police and the head of the police, Roni Alsheikh, is actually a national religious Jew. So, he’s part of the demographic of this party. That puts, so now, Naftali Bennett of the Jewish Home Party has a reason to wait until it gets to the judicial level, and then he can actually continue to support Netanyahu in the name of being anti-courts. Then again, it still stays on the main question. What can Netanyahu do with a little bit more time?I don’t think that if he goes to war in Syria, for example, or in Lebanon, that’s going to save him. I don’t think that he has any intentions or ability to make any kind of peaceful gestures, or to make any withdrawals because that would immediately take away his base. So, right now, he’s appealing to popular support, but this popular support is very fleeting. In many ways, it resembles this kind of narcissistic approach of President Trump in the United States responding with a lot of vehements and personal accusations against people who criticize him, but there’s no substance to this. And I don’t think that Netanyahu can survive this. AARON MATÉ: Shir Hever, Real News correspondent, author of The Privatization of Israeli Security. Thank you. SHIR HEVER: Thank you, Aaron.